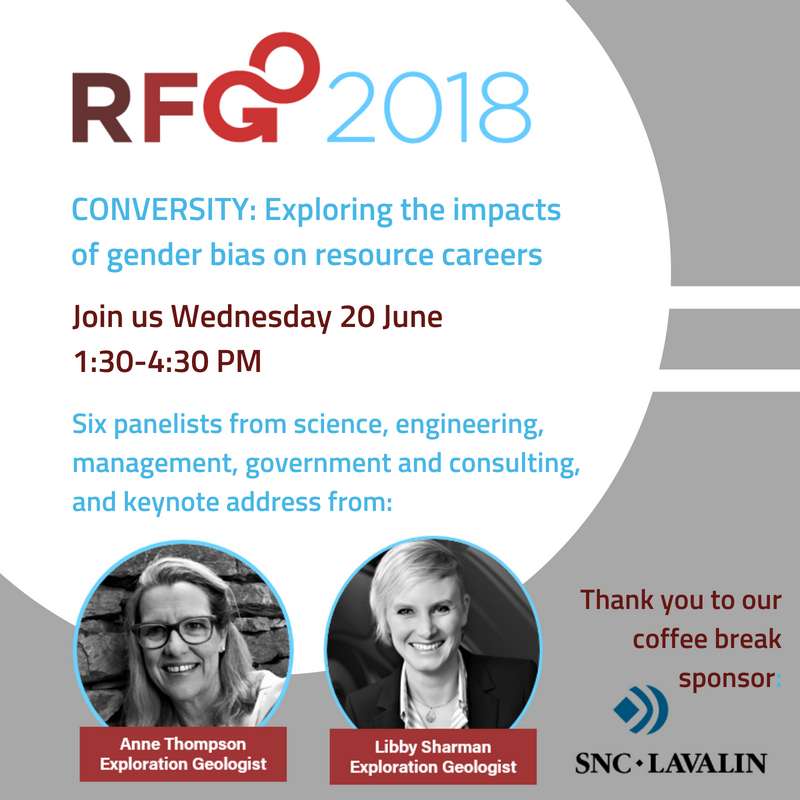 At 1:30 pm on Wednesday 20 June in Room 210 at the Vancouver Convention Centre, keynote speakers Anne Thompson and Libby Sharman will discuss the challenges they have faced and strategies to overcome them. Following the keynote, we will have two panel discussions, separated by coffee and cookies. Our speaker and panelist biographies are listed below the poster. 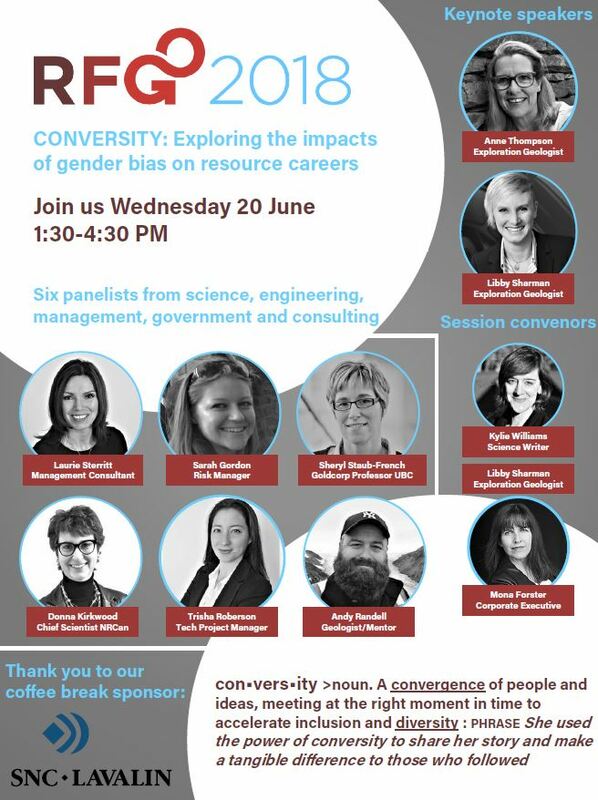 Come along, bring a friend or two, and let’s turn resource sector workplaces into safe, inclusive spaces where everyone is welcome. Exploration geologist. Founder of PetraScience Consultants. Co-editor Atlas of Alteration. Half of a dual career couple. Councilor @SocEconGeol. Editor @RFG2018. Parent. Advocate for new approaches to diversity. Typically optimistic. Libby is an exploration geologist with a research background. She completed her PhD at McGill University and has since then gained experience in different facets of the exploration and mining industry including as a geologist, researcher and communications specialist. She has experience on varied deposit types and is currently working for BHP in Chile as their Principal Global Geoscientist for copper exploration. Her eclectic background and personal experiences have fostered an interest in improving the mining industry, and making it a more inclusive and appealing sector in which to work. Having completed her PhD at Imperial College, Sarah then went on to work as a Geologist for Anglo American. She was lucky enough to live and work in Canada, Brazil, Southern Africa, and Europe, in a variety of functions from exploration through to sustainability, risk management and assurance. This grounding allowed her to explore different risk management techniques and uses, applying them to real situations. Together with two other risk managers, Sarah founded Satarla in 2014 (www.satarla.com). Now with 35 Associates based around the world, Satarla provides risk management consultancy, training and research to organisations from sectors such as healthcare, agriculture, charities, finance, together with petrochemicals, energy, oil & gas, and mining. Sarah is an honorary lecturer at Imperial College London and Chair of External Relations and Foreign Affairs for the Geological Society of London. Donna is the Chief Scientist for Natural Resources Canada, which conducts science in the areas of geosciences, geomatics, forestry, mining and petroleum research, and advanced materials and technological developments for energy efficiency. Prior, she was Director General of the Geological Survey of Canada (GSC) and Director of GSC Québec. Donna plays a leadership role in developing and promoting the department’s overarching S&T priorities, as aligned with the Government’s Science and Innovation agenda and with a personal goal of ensuring that science supports and informs public policy development and contributes to societal benefits. Donna has served as the department’s Employment Equity Champion and lead the development and launch of the department’s Charter for Employment Equality, addressing the challenges women face in the natural resources sector. Before her appointment with the federal government in 2006, Donna was a Faculty member with the Département de géologie et de génie géologique, Université Laval, Québec. Through these roles, Donna has developed a broad understanding of natural resources, the Earth and environmental issues from a specialized background in structural geology and tectonics. As a professor and then senior executive in the federal public service, her focus has been on the design and management of knowledge and innovation programs and policies. She has been active on the national and international scene, developing a novel research program in collaboration with various stakeholders from academia, industry and government. She promotes and helps sustain a dialogue on synergies between the various natural resource sectors and the broader science ecosystem in Canada. Trisha traded in a job as a geophysicist hiking through Colombian jungles and helicoptering around northern British Columbia to work as a Project Manager in the green technology industry. She has a BSc in Physics and a MSc in Geophysics and has done research on Chilean Volcanoes and on the NASA Marsquake seismometer, InSight. Learn how diversity issues impacted why she left the exciting world of geophysics. Kylie is a communications specialist and geoscientist. After working on base metal and diamond exploration projects in Australia, North America and Europe for almost a decade, she turned to science writing and copy creation. Kylie now writes about the science and technology that make mineral exploration and mining more efficient and sustainable. She is passionate about the human side of the industry too, especially sharing stories about keeping workers and communities safe and healthy, protecting the environment, and building an equitable and socially responsible industry.